New for 2018, ThirtyFifty will be hosting regular wine tastings in Edinburgh, with a diary of events at the Otro restaurant. Otro is a very short walk from Haymarket Station, in the heart of Edinburgh's West End. There are plenty of dates for our popular One Day Wine Course on a Saturday which include a delicious lunch. The aim of the day is to cover the many aspects of wine tasting in an informal and fun way, in the company of like-minded wine drinkers. With 17 wines and a 3 course lunch to enjoy, the course provides excellent value for money too. 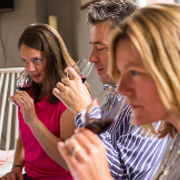 We can also host our wine tasting events for private groups or corporate wine tastings at various venues in Edinburgh. Not found what you are looking for? Register your interest in attending a wine tasting event in Edinburgh by completing the form below.